Unique architecture with hardly a straight wall, these 2 eco friendly turf roofed houses are in the stunning NW Highlands. Minimum 3 night stay. Lovingly restored castle near Largs sleeps 8 people. Sauna in tower room. Minimum 3 night stay. 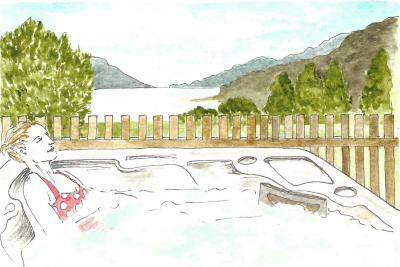 Wooden lodge with hot tub and sauna on a site offering water sports, archery, golf and more near Killin. 3 night min stay. 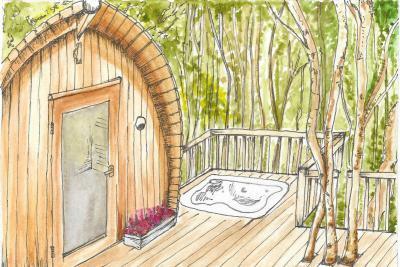 No.1 of four romantic luxury lodges for 2, overlooking the sea and with private hot tub. Near Castle Douglas. Three different lighthouse cottages offer stunning views of the rugged Shetland scenery. Loch side lodge offers a romantic getaway for 2 people at Hosta. 7 night minimum stay with Saturday arrivals. Dogs welcome. 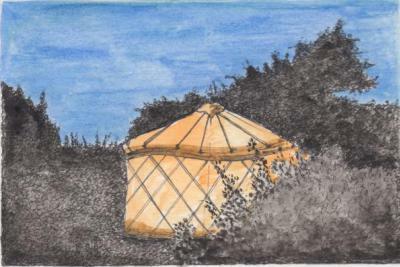 Rural pod sleeps 2 with views over countryside near Carbost. 2 night minimum stay. No pets. Romantic boudoir style garden cottage in the grounds of Fasque Castle sleeps 2 people. No minimum stay. No pets. An ancient and interesting castle hotel on a vast estate near Stirling. Eco friendly cruck-frame strawbale house with hot tub as seen on TV's Grand Designs sleeps 5 near Fort William. Weekly stays only. 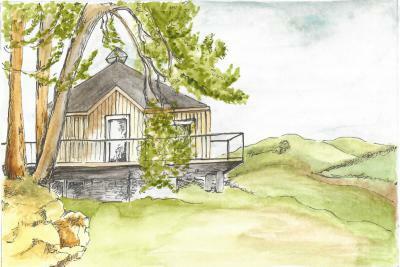 Charismatic stone barns offer a rural romantic retreat for up to 5 people with hot tub near Dornoch. Minimum weekly stays. 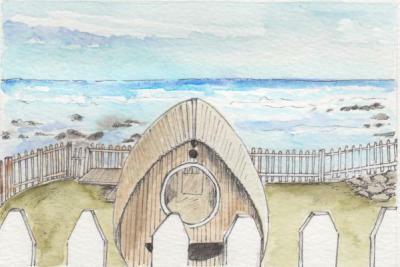 A small and peaceful eco glamping site on the beautiful Isle of Skye with luxury cabins for up to 3 people. Unusual style stone cottage with amazing views over Loch Duich sleeps 3 people in Inverinate. 7 night minimum stay. No pets. Gorgeous wooden lodge with hot tub and many quirky features sleeps 8 near Inverness. Minimum 3 night stay. Pavilion with 18th Century design and Renaissance style garden close to Edinburgh sleeps 6 people. Delightful chalet with hot tub offers a romantic retreat for 2 on a working farm in Gatehouse of Fleet. Minimum 2 night stay. Victorian former church now offers comfortable rooms and breakfast in the heart of picturesque Royal Deeside. A 17th century luxury hotel overlooking the Calder River, located close to Glasgow. Impressive grounds with large wooded area. Wooden lodge with hot tub and sauna sleeps 2 near Glenfarg. Enjoy walks to Ochil Hills from this lovely setting. Minimum 2 night stay. 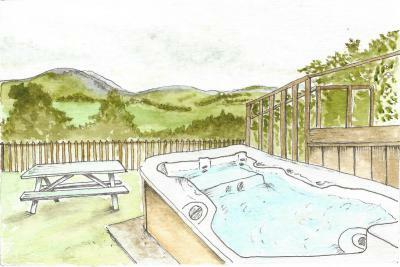 Luxury wooden lodge with hot tub, sauna and BBQ hut sleeps 14 people near Aviemore. Minimum 3 night stay. 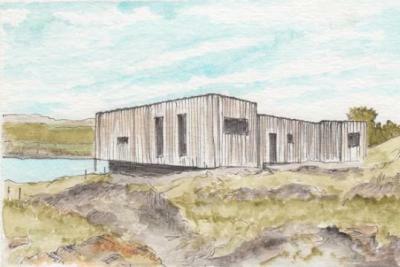 A remote cottage for 2, accessed via a swingbridge, with stunning views of the Cuillins Mountains on the Isle of Skye. Contemporary wooden chalet with hot tub offers an idyllic retreat for 2 on a working farm in Gatehouse of Fleet. Minimum 2 night stay. Self-catering accommodation in the old stationmaster's house near Inverness. Weekly stays for up to 10+2 people. Rural lodge offers the perfect getaway for family and friends to reconnect. Relax in the hot tub and enjoy the views. Minimum 7 night stay. Romantic, modern and peaceful getaway for 2 with balcony to take in the surroundings and lochview. Near Fort William. Closed in winter. Spectacular historical mansion set in the Earl of Mar Estate with pool, spa & golf course. Modern house with hot tub and views over the Summer Isles sleeps 8 people near Achiltibuie. Minimum 3 night stay. A stylish 3 bedroom barn conversion set in an enchanting woodland near Perth. Closed in winter. A waterside ground floor apartment, a quality warehouse conversion, on the banks of Leith in Edinburgh, for 2 + 1 plus dog. 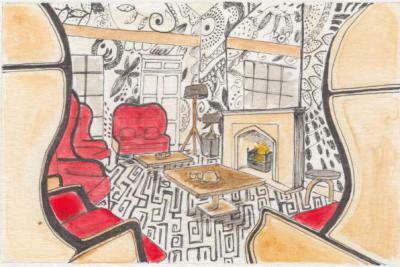 Quirky + colourful - 5 differently themed bedrooms designed in a boutique B&B at picturesque Ullapool. Min 2 night stay in summer. Spacious property with hot tub, sauna and home cinema room sleeps up to 8 near Dunure. Minimum 3 night stay. Studio cottage in the Central Highlands offering scenery, fishing and other activities nearby. Closed in winter / 7 nt min stay. A stunning 16th century tower that sleeps up to 11, located in an elevated position with views near Selkirk. Stunning shepherd's hut in a rural riverside location sleeps 2 people near Inchnadamph. 2 night minimum stay. No pets or children. Set in 600 acres and steeped in history and charm, this stunning Scottish castle sleeps groups of 12 + 4. Beautiful stone cottage surrounded by countryside and lochs offers the perfect rural retreat for 2 in South Uist. No pets.